A first class spot in the northern corner of the Hadba model forest, on the left bank of the Tigris. Up-to-date equipment; food and drinks; eastern and western music. The casino also provides food to the tourist chalets nearby. There are 35 chalets designed for 4 or 2 persons, equipped with kitchens and bathrooms, and very well furnished. They have heating, cooling, refrigerators, telephones and TV sets. A delightful lake suitable for all water sports, and fishing. It is equipped with all tourist facilities. 17 kms. Away from Duhok, 90 kms from Mosul, 885 meters above sea level, with a maximum temperature of 38 C. Zawita is distinguished for its pine-forests; its extensive shady spots make it particularly attractive in the summer. 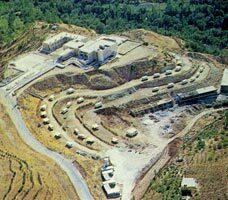 Its afforesting probably goes back to Assyrian times. Its name is Aramaic, meaning “corner”. Somewhere nearby is a wide clef in the mountain called Gully Zawita. There is a well-furnished rest house in Zawita. 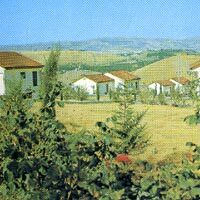 22 kms from Zawita, 112 kms from Mosul, 1507 meters above sea level, with maximum temperature of 33 C., it is one of the best-situated summer resorts in the North. 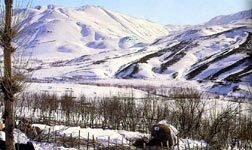 It overlooks a deep valley, with higher mountains on either side which seem to give the place a perfect climate, as good as that of any summer resort in the world, with poplars, cypress trees and a variety of summer fruit-trees. There is a large up-to-date hotel, together with modern casino, in the middle of gardens which give on to two plains, Bamarny and Suara Tuga, between which rises the Suara Tuga chain of mountains. There are also a number of tourist cabins of different sizes, all well furnished. 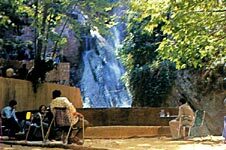 Just about 5 kms before you get to Sarsang you will come across Ashawa, a lovely summer resort famed for its waterfall. There is a beautiful restaurant, together with some local shops. Upon leaving Suara Tuga the road descends east until, a few kilometers away, it hits Bamarny, then Sikreen, famed for its water and vineyards. Some distance away is Sarsang (126 kms. 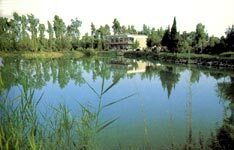 From Mosul), one of the most appealing summer resorts in Iraq. It rises 1,046 meters above sea level, with maximum temperature of 34 C. A lovely climate, cold water cascading from mountain springs, forests of cypress trees and poplars, a diversity of fruit trees in endless orchards, await the visitor to Sarsang, where there are several hotels, chalets, casinos and a night club. Throughout the area there are restaurants, super markets, playgrounds for children an open air cinema, a roving theatre, let alone the popular cafes and consumer shops, post office and a bank. On the way to Amadiya, 15 kms. 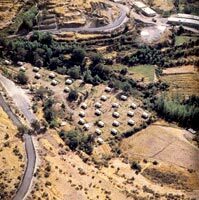 From Sarsang, you will find Anashki in a lovely spot overlooking the plains of Sarsang. Anashki is noted for its cool climate and tumbling waterfalls, which run through the casinos and eating places of the village. Close to Anashki. This resort has a healthy climate, plentiful waters, and beautiful nature, all at a height of 1400 meters above sea level, 144 kms. Away from Mosul. In a beautiful valley in the mountains, 5 kms. Before Amadiya, is Sulaf. 115o meters above sea level, with gorgeous waterfalls, one of which cascades from a height of 25 meters. 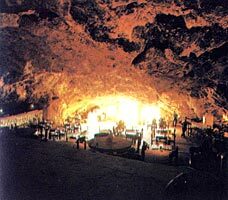 Sulfa is noted for its plentiful fruit trees and large number of its natural caves- notably Al-safa cave, heavily shaded by walnut trees. Perched on top of a mountain 1400 meters above sea level, this impregnable castle played a prominent role in the ancient history of Iraq. It is elliptical in shape, founded on a large rock, which is in one piece, surrounded by mountaintops. It has two gates, Zebar gate- leading to Zebar region and Mosul gate- leading to Mosul. On the latter gate images are graved portraying warriors with spears, swords and shields; under their feet is a great snake, which unwinds itself all the way up the gate’s arch. The castle was called after Imaduddin Zangi, who built it in 537 Hijra. It is about 90 kms away from the governorate center, and the road to it is asphalted and in good condition. 5 kms. This summer resort lies amidst tall trees and flowing waters. There are several tourist houses, hotels and casinos. 71 kms. from Sulaimaniya, 141 kms. from Kirkuk. A large beautiful blue lake, with a rest house and a number of restaurants and cafes. 65 kms. From Sulaimaniya, 26668 kms. From Baghdad. Excellent for boating, with tourist facilities. a delightful mountain resort accessible by a paved road 75 kms. Long off sulaimaniya. 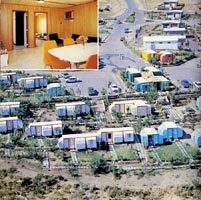 - Tourist village, a group of 39 houses (200 beds). - Salahudin Hotel: a first class hotel with a large lounge and a large dining room, in the middle of extensive gardens. - Chalet UR 216 BEDS, Chalets Sulaf 180 beds, and Chalets Hatra 588 beds. - A hall & a restaurant. Sara rush has also a supermarket, a folklore shop, children’s playgrounds, excursion gardens, etc. - Tourist camp. 76 beds (two to each tent) with bathrooms and a kitchen. There are also several privately owned hotels. Visitors for camping may rent parts of the fruit orchards. This is the place of such a striking beauty; one must see it. The gully is a narrow 10km long pass between Mount Kork and Mount Nwathnin, 60 kms away from Shaqlawa. The Mountain View is made even more gorgeous by a fantastic waterfall, which tumbles down from a spot 800 meters high above sea level. A casino restaurant near by and a few trailers for rent. About 10 kms beyond Rawanduz, the visitor will come across a great roaring waterfall pouring down from mountain tops in a green cool spot thick with trees all around. Accessible by a road built last decade between the Gully and Mount Kork. A small casino for refreshments. From Rawanduz it is a short jump to Jindian, another sylvan spot with fresh spring waters. A casino was built as a nucleus for more tourist facilities to be added in the future. 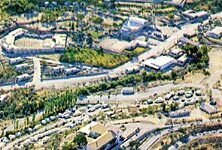 On the way to Haj Omran, about 50 kms from Gully Ali Beg, it has an up-to-date tourist hotel together with other tourist amenities. 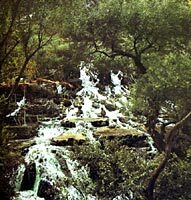 On the northeast boarder, to the east of Mount Hassarost, 69 kms from the Gully’s water fall. This summer resort, 1780 meters above sea level, is very cool at night but remarkably temperate by day, with a maximum temperature of 28 C.
The eternal fire at Baba Gurgur, shows how economical is the production of oil in Iraq. One of the eldest extant monuments. One of the most beautiful artificial lakes in Iraq. It was formed after building the Samarra dam, for irrigation and controlling the floods of Tigris and Euphrates. It is reachable from Baghdad via Falouja, Ramadi, or Samarra. Tourists can fish, swim or camp at the lake.